Where Learning Progressions have been identified, they have been seen as offering a basis for informing teachers' understanding of where their students are in their learning, and the specific problems they may be having, so their teaching can be adapted in ways that will help keep their students moving ahead. Progressions also can provide understandable reference points that assessments could target, so that their results would be more useful for informing teachers' instructional decisions. A new CPRE-CCII Report - A Hitchhiker's Guide to Thinking about Literacy, Learning Progressions, and Instruction - argues that the concept of learning progressions is not likely to be as useful or as empirically warranted for describing the growth of children's and students' understanding and competence in literate communication - in reading and writing - as it has been for describing the growing understanding of some more specific concepts and skills such as the idea of number and other aspects of early arithmetic. Nevertheless, the report argues that, for teaching and learning literate communication, these same benefits could flow from using well-designed, ordered, curricula, materials, and activities that systematically and repeatedly help students make connections between the conventional ways texts "code" meanings and particular instances of those meanings. The curriculum itself can define the reference points for defining "progress," and students' performance in its activities and routines can inform teachers how they are doing and suggest what to do to help them. Fritz Mosher; and Margaret Heritage (2017). 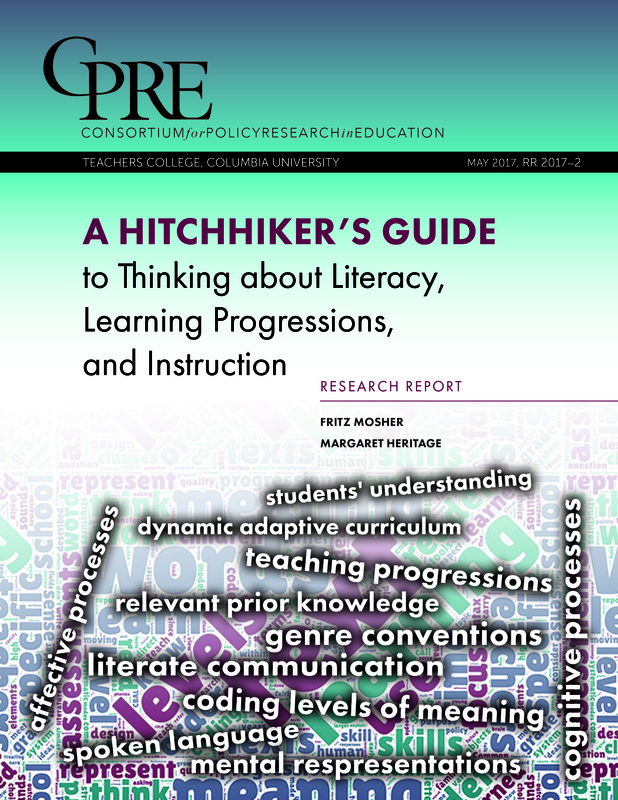 A Hitchhiker's Guide to Thinking about Literacy, Learning Progressions, and Instruction. CPRE Research Reports.